The 2018 edition of The Offering is here!!! 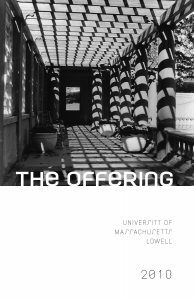 The Literary Society publishes the annual campus literary magazine, “The Offering,” which features poetry, fiction, nonfiction, and visual art submitted by UMass Lowell students, alumni, staff and faculty. Student members may apply for editorial positions on the magazine, announced each fall. Anyone in the UMass Lowell community may submit work for consideration, with submissions open generally from November 1 to February 15, and the magazine appearing in print in April. The club keeps students informed of literary activities on campus through our UMass Lowell clubs page and its Facebook page. Please read our Submission Guidelines.